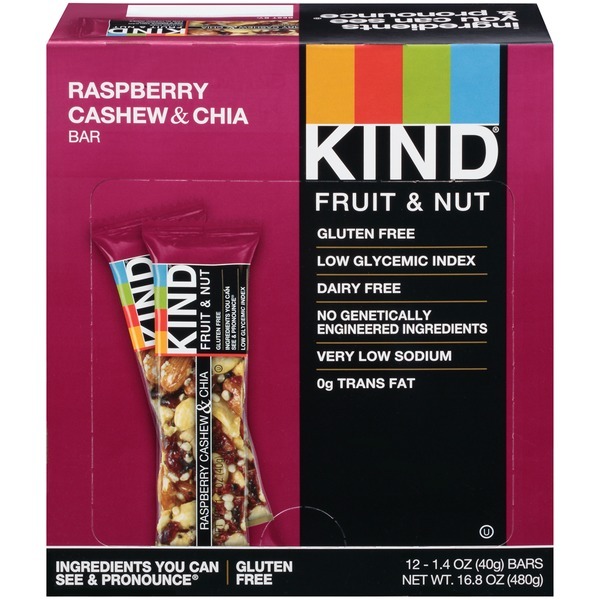 Do the kind thing for your body, your taste buds & your world™Welcome to the KIND community! Here at KIND, we think a little differently. Instead of "or" we say "and." We choose healthy and tasty, convenient and wholesome, economically sustainable and socially impactful. From the snacks and foods we make, to the way we work, live, and give back, our goal is to make KIND® not just a brand, but also a state of mind and community to make the world a little kinder. We call this the KIND Movement, which has inspired millions of unexpected acts of kindness around the world. Join us at kindmovement.com.Kindly yours,Daniel Lubetzky, KIND Founder Made from whole and simple ingredients, KIND® snacks only taste indulgent. Whether you're at the gym, at the office, or on-the-go, KIND® snacks satisfy from the first bite till the very last. Cashews, Almonds, Glucose Syrup. Peanuts, Honey, Cranberries, Sugar, Rice Flour, Raspberries, Chicory Root Fiber, Chia Seeds, Vanilla Extract, Soy Lecithin, Natural Flavor, Sea Salt.